You begin your adventure on Insect Island. The enemies on Insect Island often begin by minding their own business until they've been on the screen long enough to get angry at you. This gives you plenty of time to set them up in just the right way so that you can crush them with rainbows and earn small diamonds from them. Attack as many enemies as you can in order to powerup your rainbow creation abilities quickly. Worms pace back on forth on their platforms. They will drop over the sides when they get angry. Cocoons dangle from silk until they drop to a platform below. Then an angry worm awakens and climbs out of the cocoon. Bees float around the screen, with no particular aim. They speed up when they get angry, but they do not pursue Bubblun or Bobblun. Hives drop from the top of the screen. When they hit a platform, a pair of angry bees will escape and fly about. Spiders hop back and forth, and they hop in Bubblun or Bobblun's direction. They can shoot webbing above them and climb up. At first, ladybugs are content to wander back and forth like worms. However, they get angry, they take fly and fly through platforms. Crows start off in eggs, and fly toward Bubblun and Bobblun. They don't fly continuously, stopping every so often. They get faster when angry. Like it's smaller brethren, the giant spider will bounce around, to the left and to the right, in an effort to get closer to Bubblun or Bobblun. It will try to land where you are standing, so be sure to move out of the way once it leaves the ground. You can attack it with rainbows by standing next to where it will land. But you will do much more damage if you manage to crush it with rainbows instead. You probably won't find Combat Island to be a huge increase in difficulty over Insect Island. However, do expect enemies to be a bit more aggressive, and fire projectiles at you. It's still relatively easy to plan your effort to collect the small diamonds in order, but you can't waste as much time as you could on the first island. There are also stretches where it is impossible to jump and reach the next platform without using your rainbows to advance higher first. Trucks behave a lot like worms, except they are happy to drive over the edge of a platform, even when they aren't angry. Tanks drive back and forth on their platforms, and they fire projectiles straight ahead of themselves. Helicopters will remind you a lot of bees. However, they are a little less predictable, and change altitude more frequently. Cannons are similar to tanks, but instead of firing projectiles ahead, they launch bombs at an angle, which bounce around until they explode. Bomber planes fly back and forth at one constant altitude, releasing bombs that drop straight down. Bunker soldiers like to hide out in their boxes tossing out pairs of bombs at a time. If the bunker is destroyed, but not the soldier, the soldier will pursue you rapidly. The giant helicopter will behave very similarly to it's smaller cousins, flying back and forth while occasionally changing altitude. It particularly likes to drop down to whatever level Bubblun is at. 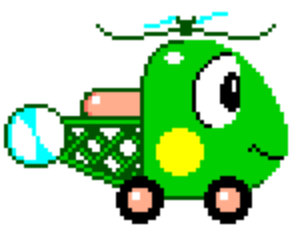 However, this helicopter borrows a talent from the bombers, and drops a steady stream of bombs down to the ground while it flies around. Crushing it with rainbows will kill it faster, so try to lure it to the bottom of the screen, and then jump up to the top and drop rainbows on it as quickly as possible. For many beginners, the third island represent a significant increase in difficulty. The enemies become a bit quicker and more aggressive, leaving you with less time to coordinate your attacks if you are trying to collect the small diamonds. The stretches where there are no platforms to jump on become longer, forcing you to use rainbows in order to advance. When in doubt, focus on your survival first and item collection second. Opposite of how Frankenstein is normally depicted, these Franks move quite fast. They're still not too smart, and walk off of any platform. Werewolves move as quickly as Frankensteins do, but they don't walk off platforms, and they occasionally stop to breath fire. Bats home in on you and fly steadily toward you. They can fly right through platforms in order to reach you. Vampires move a lot like the crows did on the first island. They move toward you and stop briefly before continuing their pursuit. Skeletons may remind you of the spiders on the first island. They hop around and move left or right according to where you are. The Grim Reapers ricochet off the various platforms, and occasionally drop flames which have the ability to destroy rainbows. 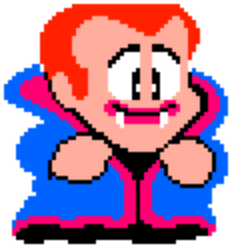 At first, the Dracula boss may seem quite tough. It moves rather freely around the screen, albeit slowly. When he stops, he releases a large number of bats that radiate outward from him in an arc. The truth is, however, that all of the bats are susceptible to your rainbows, so if you arrived with fast triple rainbows, you can take all of them out in one fell swoop. In fact, with that kind of power, it's easy enough to lay a bunch of rainbows out and wait for Dracula to stop right in the middle of them before jumping on them and crushing Dracula with all of the rainbows you created. With that strategy, you should be able to take him out pretty quickly. If you didn't arrive with triple rainbows, you'll have a tougher job ahead of you, but it's still possible as long as you stay out of his way while he's moving around the screen. The madness continues on Toy Island. Naturally, the aggressive level set by the enemies on the previous island will continue here. On top of that, the enemies can be a little less predictable, forcing you to deal with them immediately instead of trying to plan out your attack. Large gaps occur between sets of platforms. If you can make it through this island in one piece, you will have learned valuable lessons on how to deal with tricky situations that will benefit you throughout the rest of the game. Clowns continuously ricochet off of any surface. 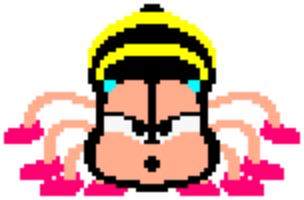 They don't actively pursue you, and unlike many enemies, they don't get angry after being on the screen for too long. Nevertheless, they can be quite a nuisance, and should be removed quickly. One of the few truly predictable enemies on this island, the othello chips simply float back and forth constantly at one height. Water guns move back and forth on any particular platform, and occasionally fire squirts of water across the screen. The boxing gloves on springs are the other predictable enemy: they bounce in place at one location and never move away. Light balls bounce along platforms and eventually make their way from the top of the screen to the bottom. At first, it may seem like there is no difference between light and dark balls, but dark balls have the ability to change the direction they bounce in. Puppets dangle up and down from their strings until they get angry, at which point they free themselves from the strings in order to attack Bubblun or Bobblun. These hands are attached to the edges of platforms, and move in and out. Remove them before trying to advance higher. 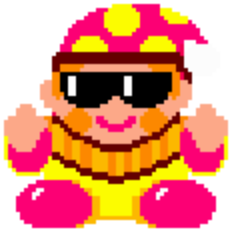 Compared to the previous boss, the Clown is much easier to defeat. He bounces around the room at 45 degree angles, and releases up to four smaller clowns to help him attack you. But none of the clowns move with any purpose, and they're very predictable. Prioritize your safety by making sure you don't stand where any of the clowns are going to move to. Then create as many rainbows all around as you can in order to attack the clowns, and crush the boss with as many rainbows as possible. This page was last edited on 17 August 2015, at 13:27.